My last post was about how I wished for a return to the days when I wrote more and better stuff for this blog. Today does not mark such a return, but something rather far from it. Nonetheless, this is IMPORTANT STUFF. 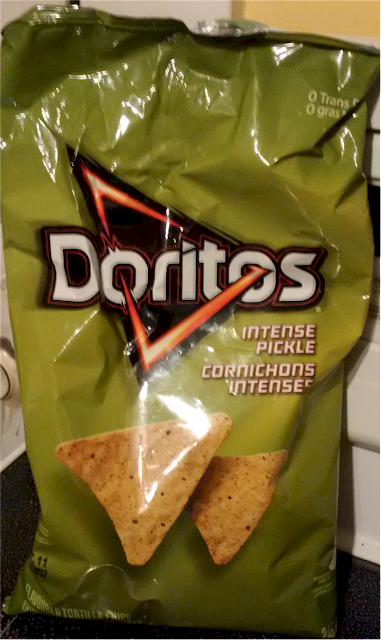 There was a 2-fer kind of sale on Doritos at the grocery store today, plus there was a flavour on offer that I had never seen before: Intense Pickle! Speaking of junk food, I am always rather amazed at the wider variety found in American grocery stores as opposed to Canadian. I mean, in Canada you might find like 3 flavours of Mountain Dew on any given store shelf, where in the US it is more like 6 or 8. Same goes for chips, candy, etc. Given the fact that our national diets are very similar, I'm guessing it is simply a function of how much larger the US market is; there are enough consumers to make more variety financially viable. Or maybe, Canadians are simple folk who would just stand in the aisle undecided until the store had to close if presented with so many choices. Hell, I don't know why, really. Why are we talking about this anyway? Can we just talk about the chips I tried today, please? Sheesh! You and your rambling tangents! Don't get me wrong, it's kind of endearing and one of the many things I quite like about you. You da best, dear reader. Where was I? Oh yeah, Intense Pickle Doritos. I think pickle flavoured chips are one of those black-and-white, love 'em or hate 'em kind of things. People who like pickle chips really like them, and people who don't really don't. Obviously, I'm in the pro-pickle chip crowd. Even so, I couldn't quite get my head around corn-tortilla-chip-pickle-flavour fusion, let alone an intense version of said synthesis. Intense Pickle Doritos are frikkin' awesome. Also, not too intense. PS - In case you're new here or whatever, please know that I have no relationship, financial or otherwise, with the makers of these pickle chips, and as such have not and could not receive any kind of consideration monetary or otherwise for my frikkin' awesome review. Actually the diets of the two countries are not very similar at all. It might seem on the surface but talk to any dietician and they'll tell you that U.S. food tends to have much more fat and starch than Canadian food. Even our pork is leaner than down there as the pigs are fed different things. The flour in our bread is from a different variety of wheat. Generally our tastes are different. I do want to try the Intense Pickle chips though. Hey, thanks Clark! I had no idea, despite having travelled in the US pretty often. Don't try those chips though; I ended up eating the whole damn big bag. Doritos, invented at Disneyland, perfected in a flavor factory in New Jersey. Our tastebuds and our will to resist stand no chance. I will be assimilated and become one with the Pickle. Of course Canadians and Americans are dramatically different. America lives with Starbucks while the Canadians get Tim Hortons. I ate a lot of Doritos in my stoner days. Now I don't go for flavored chips much except the occasional barbecue potato chip for old old time's sake. Those were the ambrosia of my junior high years, when I went from being a four-eyed outcast to being a fat, four-eyed outcast. I still rode my bike everywhere, running the gauntlet of hurled taunts and flung footballs to get clear of the neighborhood. But I hunkered down with a bag of snack food whenever I was hiding in my lair. All I have to say is: Doritos "Jacked" Spicy Street Taco. Got 'em in the States, don't know if they are available here. The name says it all, and it don't lie. Disclaimer here about how Frito Lay is one of the worst offenders when it comes to engineering food to make it, quite literally, addictive to humans. There is some serious science going into those bags; and not the good kind. Fanky Fank - I will keep my eyes open next time I'm stateside. Also, I have no doubt that said corporation is fully engaged in the shady sciences of junk food engineering.